Open Swim is Free to enrolled students and to families who are enrolled in at least two classes per week. Is the pool available for private parties? Yes, Blue Buoy is a great venue for birthday parties and special occasions! The pool is available Saturdays after 2pm, and Sundays 11-1pm or 2-4pm. Learn more about Pool Parties. 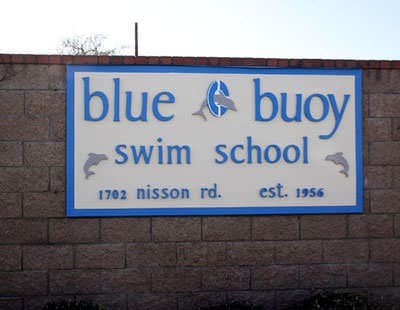 All of our instructors are CPR certified and receive at least 30 hours of in-house hands-on training in Blue Buoy’s teaching philosophy and methodology. What temperatures are your pools kept at? Both of our pools are maintained at about 90-93 degrees. An individuals physical comfort level is directly related to motor skills and learning. Keeping the water at this warm temperature not only aids in the learning process, but makes it comfortable and enjoyable. 16-20 lessons typically provides a suitable foundation with reference to breath control, balance, mobility, and safety awareness. Like dance or music, swimming is a process that must be nurtured and developed over time..